Vera is a tech and investment management expert with a keen interest in both emerging and developed markets. She is a Harvard Business School alumnus and also studied art history at Cambridge University, where she was a recipient of the prestigious Gates Scholarship. Vera has a particular interest in emerging e-commerce markets, having previously worked as a consultant to Village Ventures on its global expansion strategy. 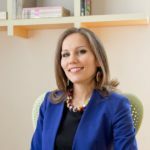 Prior to becoming General Director for Lamudi LATAM, she worked for nearly three years as an investment manager for private equity fund Bamboo Finance, which specializes in low-income markets. Currently based in Mexico City, Vera leads the Latin American team, bringing her expertise in investing in developing markets to Lamudi Mexico (www.lamudi.com.mx). It is estimated that Mexico will reach 65 million Internet users this year. This is having a significant effect on the local real estate market. According to Lamudi’s own research, 82 percent of consumers now use the Internet in their real estate search process.